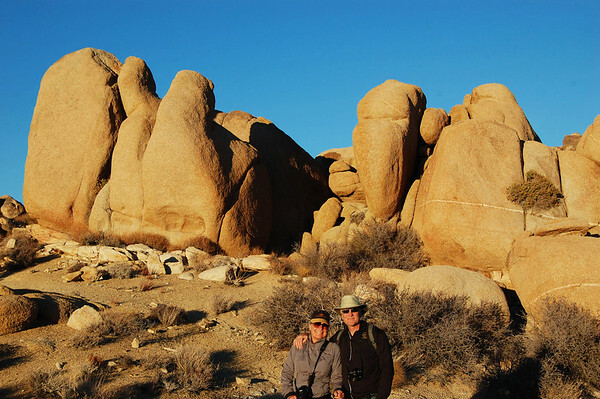 Today was Linda's birthday, and our friends, Esther & Steve, joined us for a little afternoon hike in Joshua Tree National Park. We loaded up in the Jeep and headed out. The sun was already quite low in the sky and the lighting was very nice as we drove through the park. 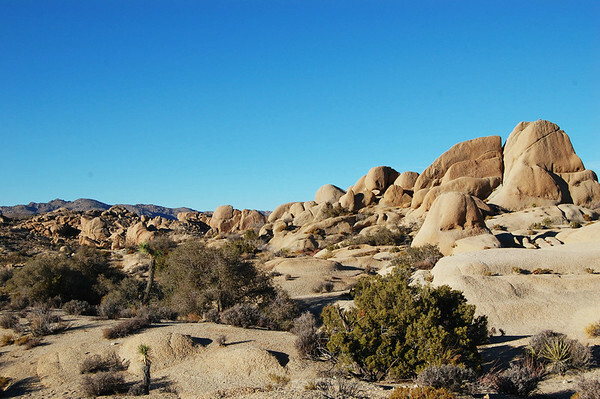 Joshua Tree National Park has about 800,000 acres, so it takes some time to get around. 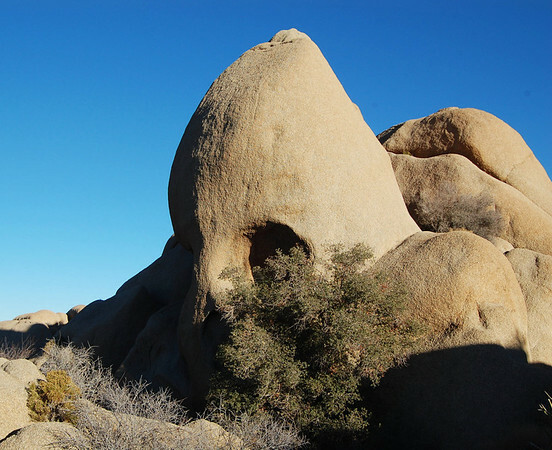 We parked at the end of the Jumbo Rocks Campground and headed out on the 1.7-mile Skull Rock loop. 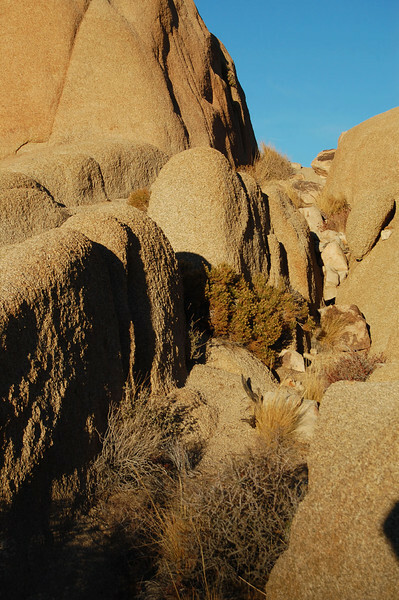 It's a pretty trail with great looks at ... well ... jumbo rocks. 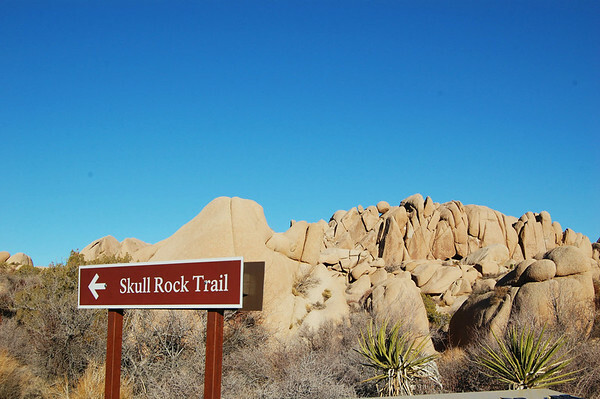 The first half-mile of the trail leads to Skull Rock and has several little signs identifying the various plants along the way. 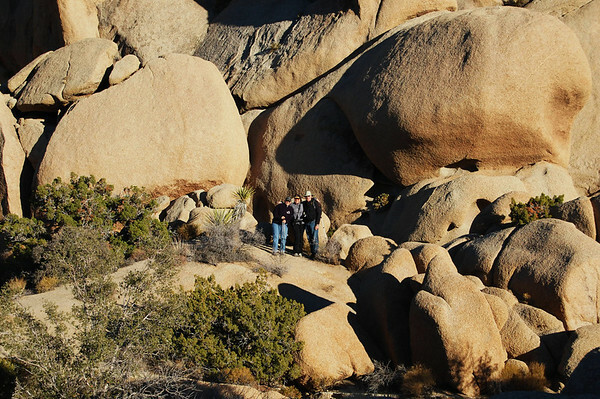 Linda, Steve, & Esther posed for a photo up against a big rock background. You can barely see them in the center of the above photo, so I had to zoom in. 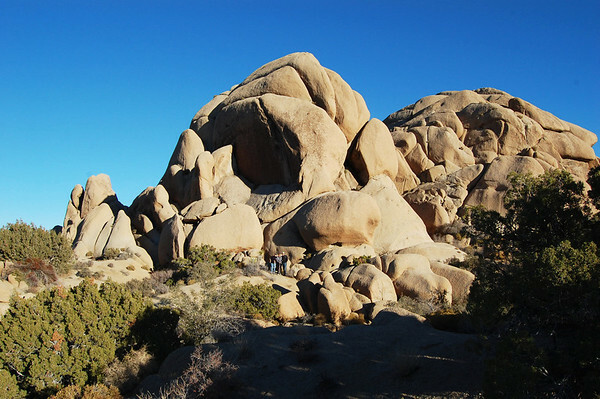 We took in the beautiful surroundings and eventually came to Skull Rock. It's not all that impressive and I certainly wouldn't make this hike just for that reason. This landmark is just off the side of the road and their are pull-offs, so it's easy to stop and take a quick glance. That's the one downside to this trail - it stays too close to the road. But at least the traffic was minimal. 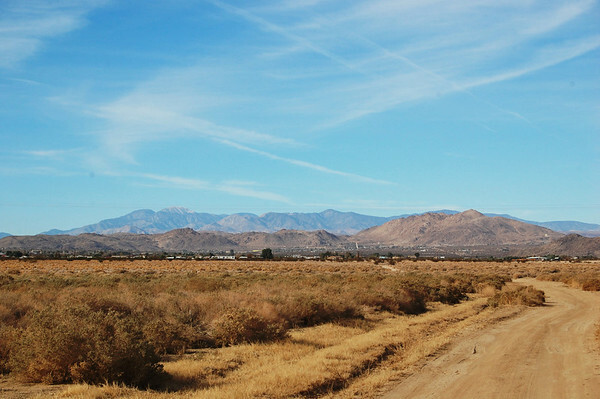 We crossed the road and looked for the trail, but we crossed at the wrong place and there were bunches of little trails going in several directions. Had we crossed at the crosswalk, ... duh, the trail was easy to find. 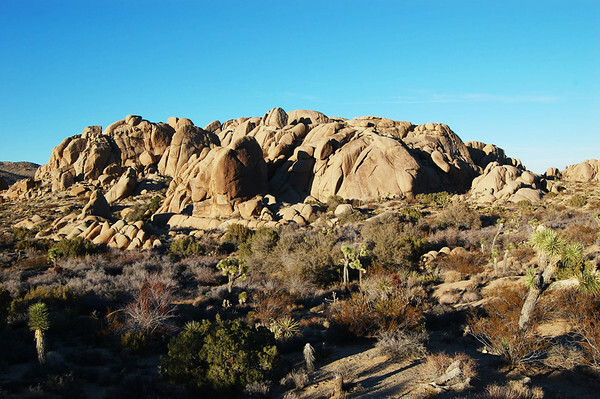 More Joshua Trees and rocks. 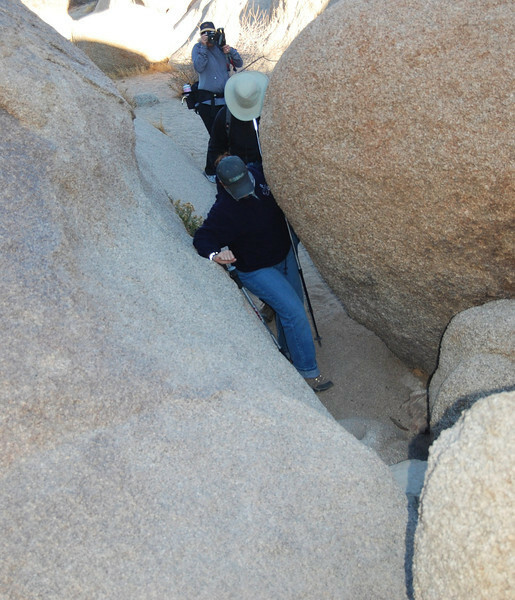 In one little section we had to squeeze through the granite boulders. The return trip was into the sun, so it was hard to see. But the rocks behind us lit up. The gorgeous blue sky made a perfect backdrop. And Steve & Esther made great models. 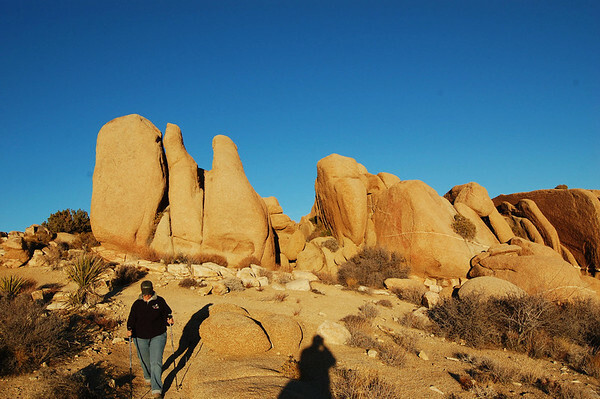 The trail ended across from the Jumbo Rocks Campground entrance, and we walked through the campground back to the Jeep. We headed back home and arrived just after the sun set. That was a nice little afternoon jaunt.